I first met Yamamoto san in October 2003 on a visit to the famous temple Daigo-Ji in Kyoto. He was sitting in a small stall, sourrounded by the most colorful and humorous pictures. Taking a good look, there was of course Daruma san among the featured subjects. On this picture below you can see his BENTEN, one of the seven deities of Good Luck, another frerquent topic of his pictures. Yoshio Yamamoto, 63, makes it his life-work to revive Yamashina Paintings. What exactly are Yamashina Paintings? During the Edo period, there were many travellers on the old Tokaido road, from Kyoto to Edo and back to Kyoto. Each of the 53 postal towns on the way had its own speciality, mostly some local food. Yamashina, but even more so the nearby town of Otsu, were famous for some kind of funny paintings of religious origin (Otsu-E). Yamashina is now a modern suburb of Kyoto. Japanese folk painting known as otsu-e, so named for the town of Otsu just to the east of Kyoto, along the Tokaido road, the principal route linking Edo and Kyoto. Shops hawking cheap souvenirs included open-air painting studios where block-printed folk subjects embellished with vivid ink washes were offered in unmounted hanging scroll format, or as simple sheets of paper, each with a single subject. In celebration of the Japanese New Year, the Mingeikan (Japan Folk Crafts Museum) has organized a special exhibition entitled Otsu-e: Edo Period Popular Paintings, showcasing this traditional Japanese genre of painting from the Edo Period (1615-1868). Among the auspicious otsu-e motifs on display at the exhibition are depictions of the Shichifukujin, or Seven Deities of Good Luck. Displaying images of these deities was believed to be talismanic, bringing longevity, wealth and business success to their owners. The practice of displaying Shichifukujin originated in the 15th century. 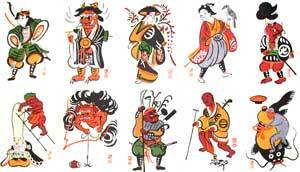 The deities were drawn from an eclectic mix of Buddhist, Shinto and Taoist figures. 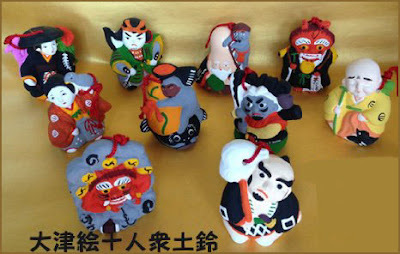 The deities are often portrayed riding in a boat together, but some otsu-e portray one or two deities, which are popular to display during the New Year. This painting also demonstrates the exceedingly simple artistic techniques used to depict the subjects of otsu-e. Usually drawn on plain brown paper, the paintings utilize a limited number of mineral pigments, typically including the colors blue, red, green, yellow and white. The first stage in creating the paintings was to make an outline in black, which was then filled in with colors in simple brushwork. Each member of an artist's family pitched in to help, including parents and children. This process assured the quick completion of each work and enabled mass production of art. Many local craftsmen were involved in the production process, resulting in a pool of local themes in otsu-e art. So cheap that almost anyone could afford them, the art was often attached to doorways or glued on pillars and sliding doors in commoners' homes. There is also a special museum for Otsu paintings in the Town of Otsu.
. Shōmen Kongō 青面金剛 Shomen Kongo, .
. My Otsu Paintings 大津絵 . They remind me a lot of HAIGA, I must say. Maybe there is a link between them both after all? Being painted by sort-of laypeople for common folk, not ment to be high art, but entertaining or used as presents from heart to heart. The BIG BROTHER of Otsu paintings is still very much alive, but Yamashina paintings have been almost lost in our modern times. Mr. Yamamoto, who lives in Yamashina, is trying to revive them in his own humorous style. 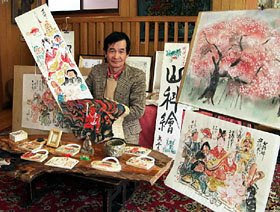 He has done so after a lot of personal research and is now selling his paintings in various temples, since about 1998. Many topics of these paintings concerned the gods of good luck and other deities of Shintoism and Buddhism, the same as we met above in the Otsu Paintings. They are painted with black ink and some watercolors, the faces of the gods are usually taken from the living men and women of his neighbourhood. 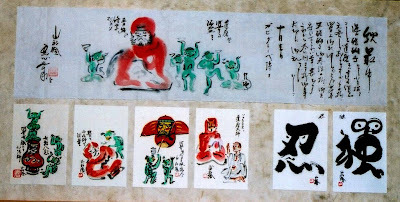 During the Edo period, these cheap paintings of the deities were all a poor traveler could afford during his trip, so Yamamoto san keeps his prices down too. After buying some of his postcards, he gave me a few more and later even sent me a long letter in beautiful calligraphy with a Daruma and some water goblins (kappa, picture 07 in my album). He wrote if Yamashina paintings would be made known outside Japan, that would be a great honour to him. Daruma san meets Sokrates, what a surprising combination of "East meets West". Yamamoto san was a schoolteacher before becoming a painter and a philosopher too. 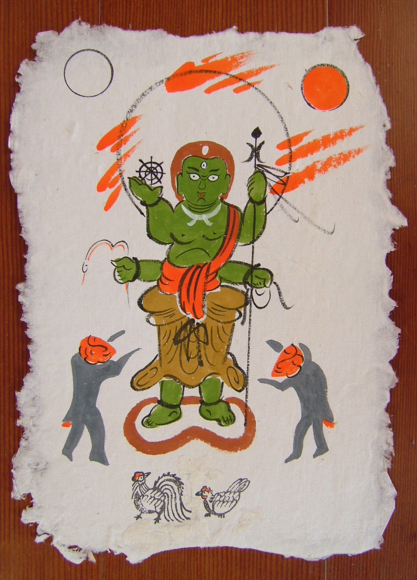 Two water goblins (kappa) hoisting a kite of Daruma in the air. Kappa is another speciality of his Yamashina paintings, but to explain about kappa here would get us too far off the subject. Just think of him as some kind of human-frog. 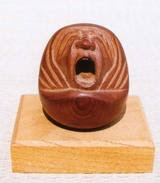 This shows a Kappa looking at a Daruma doll which has tumbled over. The surprized face of the little Kappa is quite fascinating. Four naughty Kappa boys trying to tumble a Daruma, who in turn tries to hold steadfast, keeping his balance. The individual versus society, as Yamamoto smiles wisely. 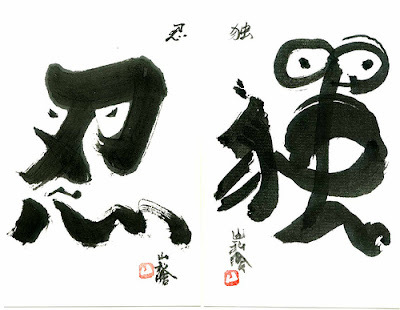 Two postcards, each using a Chinese character associated whith a virtue of Daruma in a funny distortion. NINtai 忍耐, or steadfastness and koDOKU 孤独, to be alone. Yamamoto san also gave me a larger square picture with the seven gods of good luck in the treasure-boat, together with a Daruma in their midst. 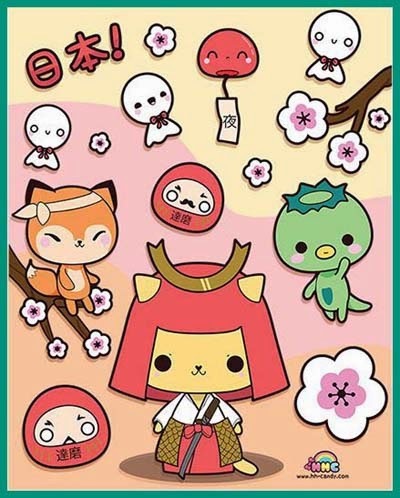 Since these seven are used in pictures for the New Year just as Daruma, he figured they might as well all sit in the same boat! All my treasures of Yamashina paintings mounted on the wall of the Daruma Museum. On the top line his letter with a sample of his individualistic calligraphy. Here Daruma is sourrounded by dancing water goblins.
. Kappapedia - My Kappa Blog . An abstract from a newpaper article about Yamamoto san in 2003. The second from the bottom shows the small stall of Yamamoto san.
. The 53 stations of the Tokaido Road 東海道 .
. PINTEREST - Kappa Gallery .